There's nothing quite like bacon jam. Let's be real this is the edible form of crack. It's sweet and salty goodness comes from slowly rendering bacon and then cooking it down with brown sugar, caramelized onions, and red wine vinegar until a thick and chunky jam develops. 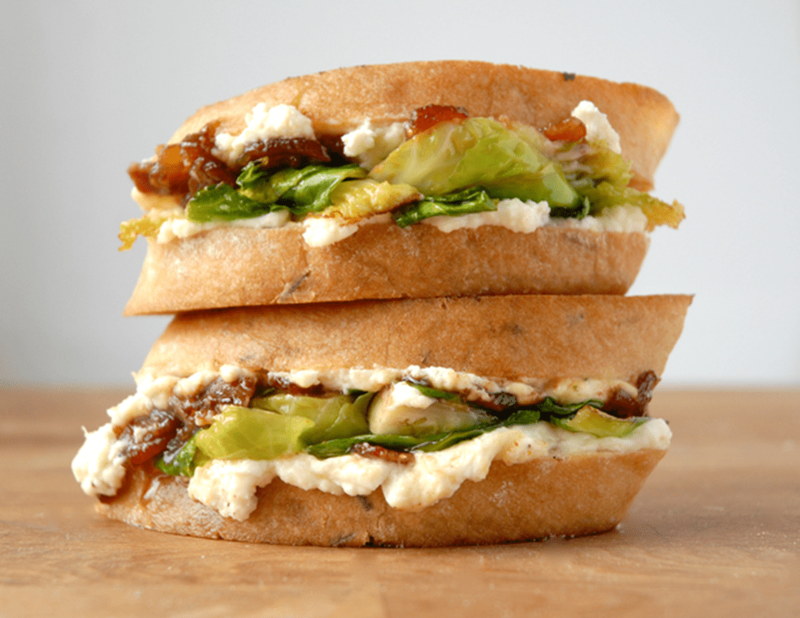 Add some fresh ricotta, nutty parmesan and crispy brussels sprouts and you've got one serious sandwich on your hands. Begin by making the bacon jam. In a medium-sized saute pan, cook the bacon over medium heat until the fat has rendered out and the bacon is crisp. Remove cooked bacon while leaving the bacon grease in pan. Add onions and saute until caramelized. Add chopped crispy bacon back to the onions and stir in brown sugar. Add the vinegar, chili powder, cayenne pepper, coffee, and salt and pepper and cook on low for about 45 minutes until a thick jam forms. Remove from heat and set aside. Sear brussels sprouts. Add bacon grease to a hot pan and add the halved, de-stemmed brussels sprouts. Cover and let the sprouts sear on the outside. After a few minutes, once they're browned on the outside, and becoming soft in the middle, give them a stir and let the rounded side get some of that browning action. Remove from heat and set aside. Assemble sandwich. Add half the ricotta to one side of the bread and top with bacon jam, brussels sprouts, and ricotta. Add the rest of the ricotta to the other slice of bread and close the sandwich. Butter the exterior and set aside. In a medium sized frying pan, add the buttered sandwich and let cook for a few minutes until golden brown on the outside and all warm and gooey in the middle. Remove from heat and let sit for a minute before serving.